There have been a lot of people weighing in on Apple’s update to Final Cut Pro. In the grand scheme of things, this is hardy an earth shattering issue – it’s just software. But if you use video editing software as part of your work as I do, it means having to make some decisions about the future investment in this particular software. I’ve been editing for a long time. I actually remember the first time I cut a piece of audio tape and spliced it back together back at CKDM in Dauphin. It was 1972. I worked with some of the very first non-linear audio editing software packages – all of them flakey and buggy compared to what we have today. I used pretty much every audio editing tool made until I settled on Pro Tools. When I started editing video I was interested in desktop PC based solutions rather than the expensive production house alternatives. 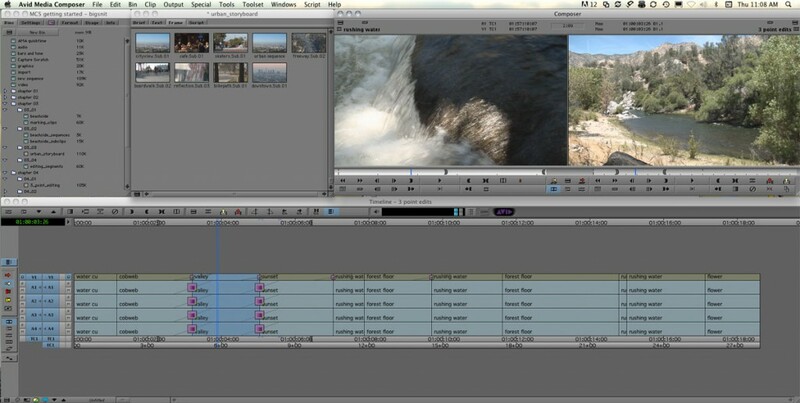 I started with Premiere on the PC, then switched to Final Cut Pro on the Mac. All that to say that I’m an early adopter and look forward to using the latest, newest tools available to me. And I’m willing to put up with a bit of uncertainty if the benefits outweigh the risks. I’ve been using Final Cut for 6 or 7 years now. I like it very much. Even my kids, in grades 8 and 11 , prefer to use Final Cut over iMovie for their school projects because sharing data is easier, and Final Cut provides the right kind of control over editing. Like a lot of people, I have been looking forward to a long overdue update to Final Cut – mostly to improve speed and file management. When Final Cut Pro X was finally unveiled this week, I was excited to discover they’ve made huge leaps in performance and really improved file management. Without getting any further into the debate, it simply is taking things in the wrong direction; I can’t use my existing Final Cut projects with it, I can’t easily export audio for post production, and it’s taken too many of the control features out of my hands. It’s possible that Apple will restore some of the things it has taken out of the software, but for me, this is simply a matter of making a decision based on my business needs. Like any decision, I try to ‘read the signs’ to see where things are going. All I have to go on is what Apple has done, and what it says it will do, with the software. The two main issues for me are collaboration and backward compatibility. Making it more difficult (or expensive) for me to export audio for post production is a major deal. Because I’m an audio editor as well as a video editor, I always treat and master my audio in another program and then pull it back into Final Cut. With the new version, in order to do that, I’ll need a plug-in that itself costs twice as much as the Final Cut upgrade. It’s more steps, more software, more money, more hassle. Secondly, there’s the issue of backward compatibility. This may seem like a small matter, but it’s huge. Not being able to work with older content means keeping 2 versions of the software on my machine to ensure that I can work on older files down the road if I need to. Eventually that need may disappear, but at least in the immediate future – say 2 or 3 years – it’s critical I am able to work on those old files. So that means keeping both the old and new versions of Final Cut running. I’m generally trying to reduce the number of types of software I use, not increase it. Having to maintain and manage 2 versions of the same software just to be able to do my work is annoying. Plus, none of the effects plugins I have bought and used over the years will work with the new version. If I’m going to have to spend more money just to use the software in the way I want, and I’m going to have to manage 2 versions, then I need to seriously think about switching to something else. Do I want to do that. No. Is it a good business decision ? I think so. So what are my options. I’ve thought about this a lot, and really the only option for me is Avid’s Media Composer. It’s a professional tool created primarily for professionals. It’s used in broadcast and post-production houses around the world. It isn’t as pretty to look at as Final Cut and it’s more expensive, but it’s rock solid. What’s more important for me – the signs for the future look good. Avid knows its market and knows its users. They’re professional editors who use the software every day cutting for news and current affairs show, and editing full length features. They aren’t trying to appeal to a larger video editing market – they’ve concentrated on making a solid tool for industry professionals. And because they also make Pro Tools, the audio editing and mastering software I use, it just makes sense to switch. And that’s what I’ve done – and am now in the process of learning how to use Media Composer (their help videos are fantastic). We’re lucky here in Vancouver to have a store like Annex Pro – I was able to get set up in just a few hours and using the software the same day. Yes, I will still need to keep an old version of Final Cut running in order to work on old projects, but I was going to have to do that anyway. Yes, I’m having to spend more money, but I was going to have to spend a fair bit just to upgrade Final Cut and then buy yet more plugins to make it do what I need, but never quite getting there. Most importantly, for my business, I feel confident that 2 or 3 or 5 years from now, Avid will continue to be making the kind of product I need to do my work. I just don’t have the same confidence in the direction Final Cut is going.